Wynelle has found the bear, thanks to a comment one of our Fabulous Finders posted 4 years ago!!! She has a wonderfully miraculous story to tell, so please read her latest comment. I have been trying to find a site to help locate a desperately missed very first bear purchased immediately upon notice in 1991 of first long-awaited pregnancy. Bless you! Large Bear by Eden, lays on stomach, cream to white with blue satin ribbon, lost at Ramstein Air Force Base Germany Post Exchange Store (PX) in 1997 (I think). It is very soft with semi-long fur and his name is Cuddles. Don’t recall if that name was on the tag, or merely given. We now know that it is an Eden cream Cuddle Me bear. I am Wynelle who originally posted the request to find my daughter Morgyn’s bear. I did not get the message in 2007 about the possible find. I have just gone through a year of cancer treatment (was terminal stage 4 with less than a year, possibly 6 months to live). Morgyn had just graduated from high school and set to go to college when I was diagnosed. She chose to stay with me, instead, to help with me and her little brother (10 years old). Although we have excellent insurance, it is still quite expensive and with the inability to work (backed up to another devastating injury), she also decided to give up her college fund for my medical care and took a job, giving us every penny to help with living expenses, Christmas, anything we needed. We also moved from our very nice, modern 12-room home to a 1940′s home in need of lots of TLC. We have never complained and consider it such a blessing, especially to simply be here to face all the challenges it presents. I have been blessed with some amazing miracles and despite the change to terminal just a few months ago, I am doing better than incredible. Today, just on the heels of an Earthquake here on the East Coast & Hurricane Irene, if my chemo brain is serving me well, we are getting horrendous rains again today. I went downstairs to check on flooding in the basement and thought I’d tackle emptying one of the many boxes that have been neglected this past year while I was going through the surgeries and mega-treatments. I came across Morgyn’s “Boo-Boo Bunny” Ice Pack from which her grandmother accidentally threw out the ice cube. Morgyn @ 19 still wants to keep this special little guy so I decided to research and found what I needed. As I was about to get up from the computer, “Cuddles came across my mind and I thought, “why not try again”. I had already spent quite a few minutes with various key word searches when I noticed a partial comment and recognized it to be my original search request that I had no idea was posted so beautifully. My heart jumped as I opened it to read my original request and then to my amazement a possible find. Do I dare hope that this person is still available and Cuddles might be still able to come home to Morgyn? Oh please let this be another special miracle for her – she has done so much for me this past year. This would be the most incredible unexpected gift to give to her, even if she is now 19 years old. She still wants that bear so much – her very first friend. Please e-mail me! I couldn’t see the picture that the person sent. God Bless each of you!! I researched with Eden many years ago to get a replacement, but after a huge run around for hours, spoke to someone who thought they recalled the bear, but it was no longer purchased. Hoping to have a remake, I have been trying to recontact them, but haven’t even been able to pull up an active site again. I still see very soft excellent quality plush animals in stores, but can’t locate them any longer or the bear. Please see what you can do if there is anyone out there with help, ideas or most unbelievably, the original Cuddles if you found it at the Ramstein AFB, Germany PX. I will pay a reward for the return. I found this…could be him? I saw that one, too, but I didn’t send the link to her. I just sent it, though, so we will have to wait for an answer. Thanks again for taking the time to look. No problem. I always feel the thought that I’d hate to ignore it and have it be the one! You’re right. That’s why I sent it to her, after you saw it, too, and thought it might be the right one. I am looking for the identical bear displayed in the picture! 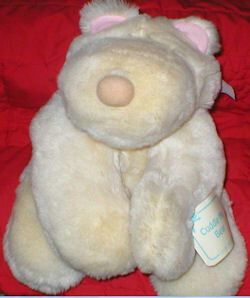 1981 Gund Bear. If anyone has one for sale or knows where I can find one please comment! Thank you. I am Wynelle who originally posted the request to find my daughter Morgyn’s bear. I did not get the message in 2007 about the possible find. I have just gone through a year of cancer treatment (was terminal stage 4 with less than a yr. possibly 6 months to live). Morgyn had just graduated from high school and set to go to college when I was diagnosed. She chose to stay with me, instead, to help with me and her little brother (10 yrs. old). Although we have excellent insurance, it is still quite expensive and with the inability to work (backed up to another devastating injury), she also decided to give up her college fund for my medical care and took a job, giving us every penny to help with living expenses, Christmas, anything we needed. We also moved from our very nice, modern 12-room home to a 1940’s home in need of lots of TLC. We have never complained and consider it such a blessing, especially to simply be here to face all the challenges it presents. I have been blessed with some amazing miracles and despite the change to terminal just a few months ago, I am doing better than incredible. Today, just on the heels of an Earthquake here on the East Coast & Hurricane Irene, if my chemo brain is serving me well, we are getting horrendous rains again today. I went downstairs to check on flooding in the basement and thought I’d tackle emptying one of the many boxes that have been neglected this past year while I was going through the surgeries and mega-treatments. I came across Morgyn’s “Boo-Boo Bunny” Ice Pack from which her grandmother accidentally threw out the ice cube. Morgyn @ 19 still wants to keep this special little guy so I decided to research and found what I needed. As I was about to get up from the computer, “Cuddles came across my mind and I thought, “why not try again”. I had already spent quite a few minutes with various key word searches when I noticed a partial comment and recognized it to be my original search request that I had no idea was posted so beautifully. My heart jumped as I opened it to read my original request and then to my amazement a possible find. Do I dare hope that this person is still available and Cuddles might be still able to come home to Morgyn? Oh please let this be another special miracle for her – she has done so much for me this past year. This would be the most incredible unexpected gift to give to her, even if she is now 19 years old. She still wants that bear so much – her very first friend. Please e-mail me! I couldn’t see the picture that the person sent. God Bless each of you!! Oh my gosh – Oh my gosh: I input the info. from Cat Jane (info. I did not have). I kept being prompted back to this site only. I must have tried different combinations of word order four or five times. I finally got one search where I FOUND IT ON E-BAY – THAT’S CUDDLES! THAT’S HER BEAR!!!! CUDDLE ME BEAR IS HER BEAR!!!! I can’t be sure if it is her exact bear (I doubt it but maybe) – it doesn’t matter – THAT IS CUDDLES!!! My daughter had a long night last night after work and is still upstairs asleep. I called my husband at work immediately and asked for his e-bay account and password so I can get it. He doesn’t think it is necessary and doesn’t care about getting it but it means so much to her and to me that I have to get it. Thank you all so very much for this special gift you have given to me just in caring and to take the time to answer my plea. God has been so unbelievably good to me, always has been, but I have to share with you: this past year his revelation of love and presence has been nothing less than a miracle. I found out on a Fri. in March 2011 that despite chemo. (after my July 30th diagnosis, many surgeries and chemo-therapy for what was originally thought to be peri-menopause, turned out to be cancer thought to be stage 1 but turned out to be stage 3), I had masses growing on both sides of my pelvis, kidney vessels were pinched off, I had severe incontinence, my bladder was being punched in (as if with a fist) and something was going on in my colon. I couldn’t wait a week. I was now stage 4 terminal with very little time. We left the doctor for the hour+ long car ride back to our home town but straight to our church to meet with two of our pastors for prayer and anointing. Prior to this, my daughter & I had decided that she, for the first time, & I, as a re-dedication, wanted to be baptized together. It had already been scheduled for that Sunday. I was thrilled. This would be my cleansing. Prayer chains started going out everywhere. We began receiving prayer replies that came from every single state in the US and at least 6 countries, that I knew of, before going into emergency scheduled surgery. On Monday night just prior to Tue. surgery I went to pick up my daughter at work and came across some of my friends from church, celebrating a birthday at the restaurant. I shared with them what was going on and we had PRAYER right there, amazing prayer – all of us, right in the middle of the restaurant and it was not only beautiful – it was amazingly uplifting. The Lord was there. His love encircled all of us so intensely that it couldn’t be denied or ignored, even from the spectators who were sitting nearby simply having dinner. I had the most incredible sense of his presence, his love and his assurance that no matter what was thought or said by anyone, I was going to be fine. I told the Lord right then that if my purpose for him had been served by my children deeply loving him and by Jesus abiding in my heart and some who could him there and were drawn to him, then, if it is time for me come home, I was ready and wanted in my heart to fulfill his will for me. We would all be better than ok. I told my friends, excitedly and jumpy inside, “Isn’t it going to be incredible and amazing tomorrow when they go in and they aren’t going to find anything!” I was absolutely beside myself with joy. The Lord convinced me that there was nothing to worry about. The next morning during the hour+ long ride to the hospital my husband kept asking me if I was scared or worried or nervous. I wasn’t!! I really wasn’t!!! I couldn’t even make myself be worried or upset. I was happy beyond belief and relieved that they could even get other surgeries pushed aside so quickly to make this happen within a matter of days (to do everything possible to save my life). But you know, it didn’t really matter – my life was saved a long time ago by the beautiful grace of God. Well, I went through all the prep, signed everything to completely open me up, if needed, to get as much out as possible. I was still entered into a phase 3 clinical study trial (I entered into it immediately on Fri. when told I was terminal) and still, as they wheeled me into the operating room about to receive the anesthesia, I just praised the Lord for what he had done in my life and in the lives of so many others because his love is so great that I am forever grateful he has shared it so deeply with me, so undeserving, yet, as his child blessedly gifted for I am his inheritance and he is mine. I had everything I needed. I was ready for his will – to bring me home if that is what was needed and through my death, others would still be drawn to him. I awoke, unable yet to open my eyes or move any of my body (I think in a “twilight” of anesthesia, trying to come back) hearing my daughter Morgyn sweetly and gently saying “Mom, Mom… can you hear me?…Dad, do you think she can handle this?…. Mom, Mom, it’s gone – the cancer is gone!” My eyes fluttered open slightly and I faintly whispered, very puzzled, questioning: “They got it all? ?” I struggled to get my eyes open; I was woozy; everything was a fog of disorientation. But I clearly heard her say next “No Mom, you don’t understand… they couldn’t find it…it’s not there!. I sat up as quickly as I could, given that I had just been laparoscopically invaded and asked “when can I go home?” My family began to rapidly relay all that had happened while I was in surgery – the primary surgeon stopping after entry and attempting to remove the masses and invasions to everything it was overtaking, going back to the images already taken and the pathology reports showing vividly that cancer masses were there while the vascular surgeon began to look himself at the kidney vessels he was to take from and repair as needed; they took colored photographs and in the middle of my surgery took them out to my husband and said “that’s where it was… that’s where it’s not, that’s where it was… that’s where it’s not!” They bombarded him with questions. He threw up his hands questioningly as well and rattled his lips (like that of a sputtering horse) and said, “I don’t know, I don’t know”. My daughter replied – “I know!” That was the beginning of an hour of praise in the recovery room of outpatient surgery (far from the inpatient recovery where I was expected to be) by all who were in ear-shot and beyond, lifting hands, calling on cell phones to declare their witness to a miracle and absolute joyous jubilation by patients and staff alike. It was nothing short of beautiful pure elation by everyone. As soon as I could get to my phone in the car, I immediately called my friends from church with whom I had prayer time the night before. The word went out like a wild fire blazing. Two days later I received an almost disbelieving confirmation from a woman I didn’t know, had never seen, who had no idea that I had cancer, much less what I had just experienced. I merely passed her in a parking lot of the grocery store after dropping Morgyn off at work. She was thought to be going about her business but I noticed (she was ahead of me on the sidewalk near the store) that she had slowed down, pensive, seemingly in deep thought (but was looking away from me and still walking toward the door of the store) then she stopped, still facing the doors rather than out to the parking lot where I was walking closer. I was attempting to take a diagonal short-cut to the doors but, unable due to traffic, was forced to walk straight toward the building to access the sidewalk close to where she had stopped. As I came up to the curb, she turned toward me and gently said, “I know you will think this is weird but please listen…The Lord layed it on my heart that I am supposed to give you something and there is a message with it.” She reached up around her neck and unclasped a necklace that appeared to me to be a heart. She reached up and clasped it around my neck. She said “I don’t know what this means but maybe you will understand – there is purpose in the healing and the Lord isn’t finished with what he has for you to do.” She reached down to the necklace she had just placed around my neck and said, “these are angel wings and you are to remember that it is his love for you and your love for him that makes this possible.” She then turned and walked away. I was left on the sidewalk with tears and awe swelling inside of me, uncontrollable, almost unbelievable, feeling so unworthy, yet as we all are, so incredibly loved. If I hadn’t believed in God and his love before now, how could I deny this as absolute confirmation not only of this miracle but his reality, his presence – real presence and involvement in our lives in a relationship so graciously designed to be shared with him. We are here solely for that purpose – to worship and share our lives with him. To draw all that we can to him to experience this unselfish love and deep desire to simply be with us. God is so good, so tolerant and so forgiving. All he wants is our love in return. Isn’t that what we all want for ourselves? Isn’t that what we should all want for each other, no matter who we are or what our station in life? We’re all worthy – we’re all the same – his children, his companions, his inheritance to gain, just as he is ours. I know this may seem far fetched that this little bear could bring about a story of belief but this little miracle is no less a miracle than all the rest. Our lives are filled with them, unaware that they are by design, not coincidence. Cuddles will now be a share bear of belief and testament that it is not our faith that brings about miracles, it’s the miracles that bring us to have faith. God Bless All who can be touched by this experience that I share not for any gain other than his. Know that you are loved!! I am in awe! What a wonderful testimony of love for our Father In Heaven! Thanks for sharing your story. I am so happy for you and your family. Truly, truly inspiring. The signs are everywhere if we stop to notice them – big and little – they are all important. Thank you for sharing your amazing story.